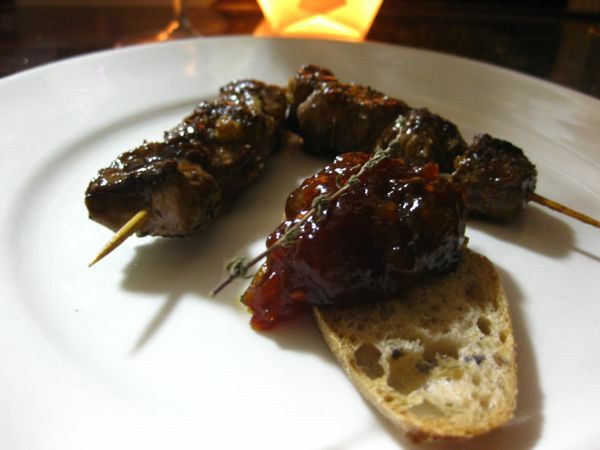 Kangaroo is such a lean and super tasty meat, as long as it is cooked rare or medium rare. It is also a great match with wine and beer. Kris : I recommend buying kangaroo fillet as opposed to kangaroo steak. It is a couple of dollars extra per kilogram, but worth it. A great trick is to use pineapple in the marinade, which helps to tenderize the meat. Kiwifruit and Paw-paw also contain enzymes that work in the same way. I normally combine some macadamia oil, balsamic vinegar, pineapple pieces, garlic and fresh thyme to make the marinade. 1 -2 hours is more than enough marinating time in a covered bowl in the fridge. Then leave the meat to come to room temperature and cook for 1-2 minutes on each side on a really hot cast iron griddle pan. Let it rest a couple of minutes before serving. Serve with Tomato and Lemon Myrtle chutney (the recipe is on our recipe page) or a simple salad of rocket, olives and goat’s chevre. As a beer match I recommend Kostritzer Schwartzbier (Germany) or Schwartz Brewery Dark Lager (N.S.W). 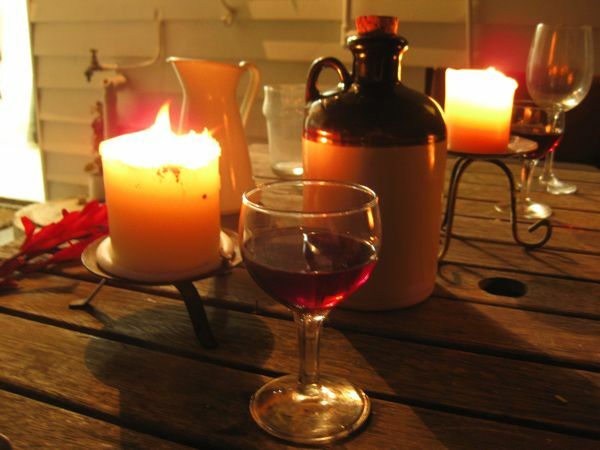 As for wine, a Pinot Noir, cool climate Shiraz or Grenache would be an ideal match. A great Tasmanian Pinot to try is 3rd Child from Campania. Even after trying some more expensive ports, this one still remains my favorite. It tastes like figs and spicy fruit and has a soft, thick mouth feel. 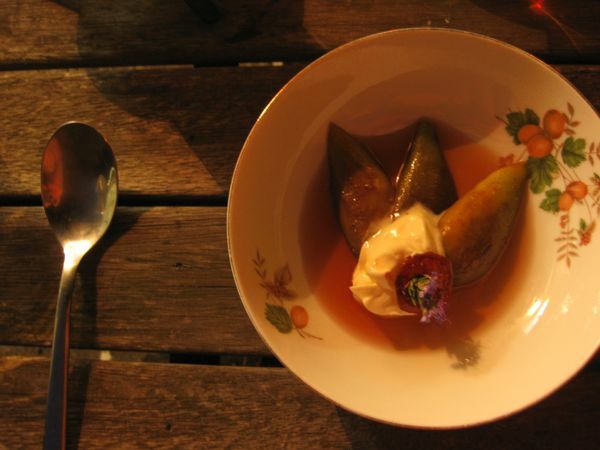 It was a great match to our dessert, Spicy poached pears. In a pot, make a simple sugar syrup of 1 cup of sugar and 1 & 1/2 cups of water. Place a cinnamon quill broken in half, a few cardamom pods, 2 slice’s of ginger, a few cloves and a chili sliced long ways into the syrup. Let it simmer for a while to extract the flavour’s of the spices. Add the pears and poach them until tender. Serve with marscapone (or whipped cream) and a small amount of the strained poaching liquid. It was such a nice day today, it really felt like the first day of spring. Caroline and I were inspired to spend time outside on our day off. We got our garden started (finally) with some herbs, salad greens, tomatoes, and chillis. 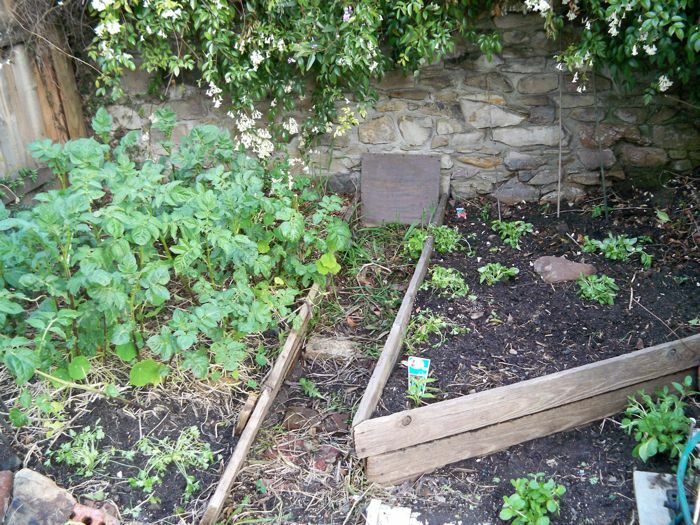 The small plants on the right are the ones we planted today. On the left are some pinkeye potatoes that have been going for a while already. Caroline: Since it was so warm today, we were craving some seafood and some cold beer (and wine). We got a kilo of mussels (a perfect amount for 2 people) for only $10! 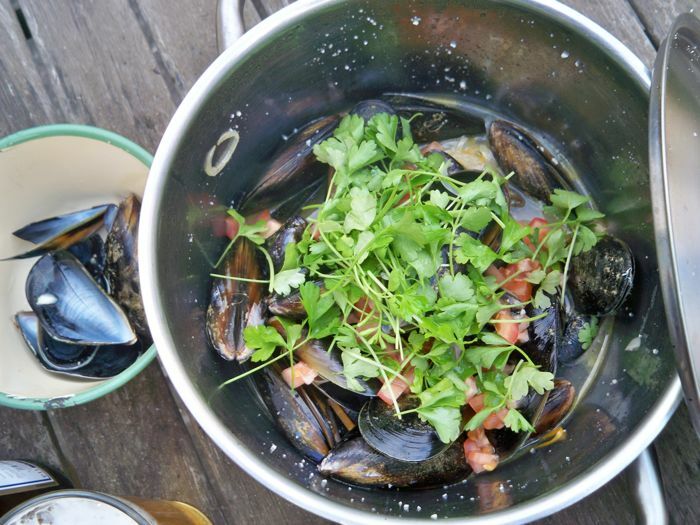 Mussels are delicious, inexpensive, and SO easy to prepare. 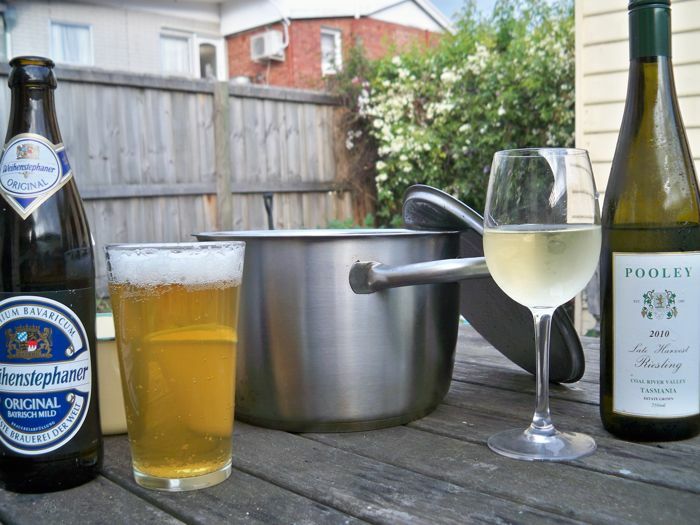 They’re also really versatile, you can use pretty much whatever veggies you have on hand and stock, beer, or wine for your liquid base. Mussels and beer are a classic match and exactly what we felt like eating tonight. Below is our recipe. Finely slice a small onion and fry in some olive oil until trasparent. Add some julienne (finely sliced) carrot, fennel and asparagus and 2 -3 cloves of crushed garlic. Give them a stir and place the lid on for 8-10 minutes, until the mussels have opened their shells. Season with some cracked pepper and add finely diced fresh tomato and some flat leaf parsley. Finish with a squeeze of lemon juice. Serve with some fresh crusty bread and butter. 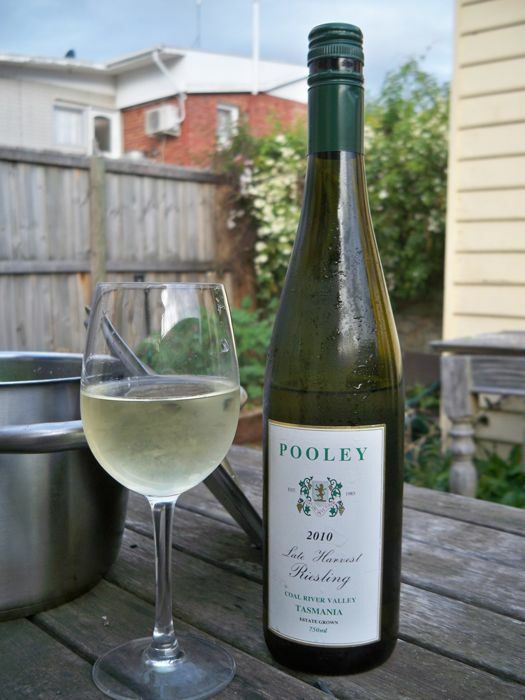 Caroline: I had a glass of Pooley 2010 Late Harvest Riesling with my mussels. I LOVE late harvest riesling (and Pooley) but it was too sweet for the mussels. A dryer riesling would have worked much better. The sweetness of the late harvest ended up making the mussels taste a bit soapy, so I moved onto to Kris’ beer for the rest of the meal. By itself, the wine was great, so I just enjoyed it by itself as my dessert instead. I think Kris had the better match with beer…. 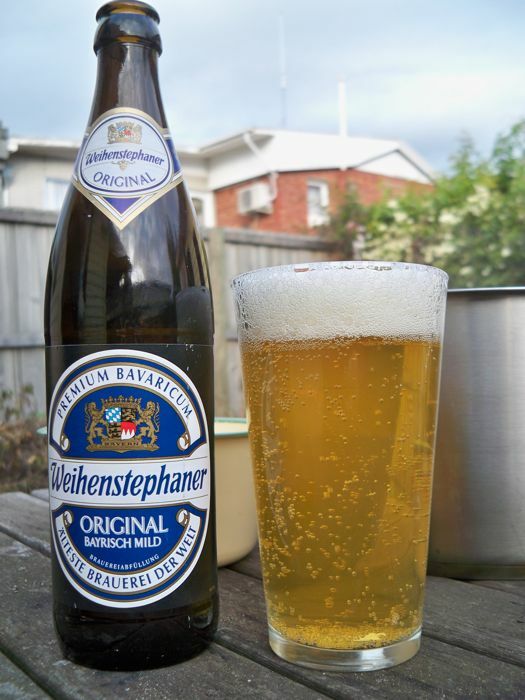 Kris: I opted for Weihenstephaner Original Bayrisch Mild (Helles) Lager from Germany. It was a great match with the mussels.It was an easy drinking lager with slightly sweet, honey malt character and some citrus hop flavour. Nothing too exciting. I do like a dry Pilsner or Belgian Witbier with mussels too. Caroline: Thanks for dinner Kris.